Despite problems with snow and ice on the tracks, state railroad firm VR said it is striving to keep 95 percent of its trains running normally. 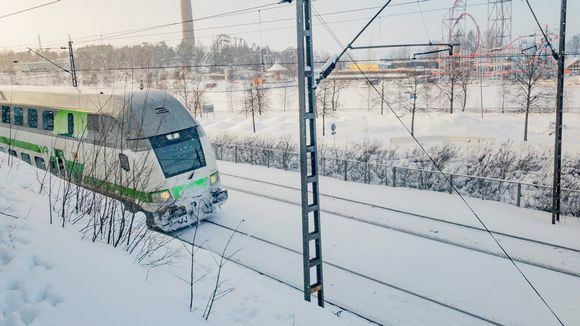 Finnish rail firm VR has cancelled several long-distance routes on Wednesday, in order to allow workers to clear train tracks and equipment of ice and snow. The cancellations were planned ahead of schedule after several weather-related delays over the weekend. Wednesday's cancellations include train routes between the cities of Helsinki - Turku, Helsinki - Tampere, Vaasa - Tampere as well as Helsinki - Lappeenranta. Updated schedule and delay information is available from VR's website in English. VR said it will transport passengers affected by the cancellations or changes by bus or on other train routes, but noted it was striving to keep 95 percent of its traffic operating normally. The past several days of snowy weather has caused significant problems for train traffic in Finland. On Monday evening only 20 percent of long distance trains were running on schedule, and about 25 percent the following day.